As more and more women are taking up sailing as a sport, the incidence of cruising couples naturally follows. Sailing couples enjoy many benefits over fully crewed boats, including more space, privacy, and much easier scheduling and logistics. Not having to entertain and train a constant flow of guests can add greatly to the experience of each member of the team. Teaching someone how to use a marine sanitation device has to be one of the most tedious chores on the boat! My wife Jan and I have also found that we are more likely to invite other cruising couples aboard – and be invited more often – when there are just two of us. With many couples, one person may have more sailing experience and may have even introduced their partner to the sport. Whatever the situation: sailing double-handed has some added responsibilities. The Cruising Club of America (CCA) captured, quite dramatically, the attention of this population when they developed the program called “Suddenly Alone.” That title probably caused, in many cases, a sharp intake of breath! The program has since been repackaged with developed course material into a product distributed to other clubs and organizations. It’s now called, a bit less dramatically, “Safety for Cruising Couples.” This should be a first stop for any couple sailing double-handed. Much more can be found at cruisingclub.org/safety/suddenly. The CCA website also has many other resources relating to safety and training that will help improve your sailing. Check it out! I’ll limit my comments to those that go beyond those covered on the CCA website, which are quite lengthy and should be studied in their entirety. Taking an extended cruise as a couple can be greatly enhanced by what some racers call the “planning war.” Let’s say you will be sailing to Maine next year; now is the time to start planning your trip. Including an overnight leg, for those ready, can buy you some treasured time in Maine. Consider what would be your ideal Plan A. Start by looking at the big picture. Layout a tentative plan of what ports you will hit at what time. Consider how many miles you want to put in on what sections. If you’re considering an overnight as part of your trip, you probably wouldn’t want it to be the leg from Long Island Sound through the Cape Cod Canal. Your first double-handed overnight passage, especially for couples with less experience, should be in areas with fewer hazards and commercial traffic, if possible. If there are particularly tricky areas on your route, plan them out so they mesh well with your master plan. The Cape Cod Canal will likely be part of your route. Using your dates of passage, find out what the currents will be doing on those days. You can use your favorite app or an online site such as tbone.biol.sc.edu/tide/index.html or co-ops.nos.noaa.gov/noaacurrents/Regions. Don’t plan your trip so that you would have to buck a foul tide; stop earlier or sail later to avoid this. Marion and Onset on the Buzzards Bay side of the canal, or Sandwich and Provincetown on the Cape Cod Bay side, would help solve this problem and still be good starting points for your overnight leg. Consider your average cruising speed and figure how many miles you will likely sail in 24 hours. 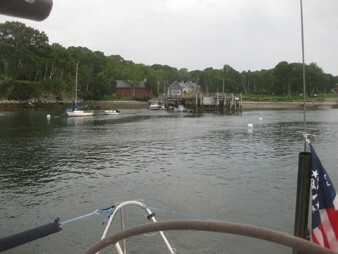 Use this distance as a starting point and figure where on the coast of Maine that would put you. This will be your target area for Plan A. Drill down on this area using either PC-based navigational software, an app, or paper charts. Don’t even consider doing a trip like this without paper charts. The waterproof chart books are excellent for your safety as well as for planning. Buy them now, as they will be a tremendous asset for planning and discussions. Using 24 hours for your first overnight target will, assuming you leave in the morning, put you at your destination in the morning. This gives a nice buffer, time-wise, when you get to your destination, so that you can slow down in unfamiliar areas. Look for ports that have big, open harbors that will allow you a stress-free arrival after a possibly long night. Consider that your final approach could be in limited visibility. Play “what if” games while planning: “If we had to make port for some unseen event, where would we head?” Do the math; calculate how much fuel you would need to make your destination if the wind went really flat. It does happen, especially at night, in the summer. Even at a modest 5-knot average, a 24-hour run from the Cape Cod Canal will put you in the Casco Bay area of Maine, where your cruising guide will recommend many wonderful spots. If you were to have a nice southwest breeze and average 6 knots, it could put you at the entrance to Penobscot Bay. So, with your Plan A you should prepare for a leisurely sail, a boisterous romp, possibly or a mind-numbing ride with the diesel humming. Do as much of the planning as you can early on, and you will be much more relaxed when finally approaching your destination. Plan now for how you will get weather forecasts underway. If you will have Internet access, you’ll find an exhaustive list of sources at the National Weather Service’s Marine Forecast page: nws.noaa.gov/om/marine/faq.htm#6. Find your favorite during the planning period. Now is also a good time to learn more about weather and how it changes in your target area, in this case the Gulf of Maine. The planning stage is also the time to develop needed waypoints. If you have access to the GPS or plotter you will be using, enter the waypoints now. If using Expedition or other software this can easily be done, at home, and be ready once you’re aboard. If possible, save these waypoints on alternate media and find out about sharing waypoints and routes across platforms. On this, and all, operational factors, remember the “Suddenly Alone” deal; you should both be comfortable with these methods and processes. When the time finally comes, the stars are aligned and the weather gurus have spoken, it’s time to get underway! Here we’ll walk through the process for a double-handed passage and emphasize some tips and rules. Underway Tip #1: Be as sure as you can be of the weather! Use a trusted source of a specific marine forecast, from your planning stage, not just the local TV station’s “10-day forecast.” Listen to the VHF forecast for your area, allowing lots of time, as the broadcast “loops” are quite long. Make sure you listen to several VHF weather channels to make sure you are tuned in to the one with not only the clearest reception, but also the most relevant info for your destination. Underway Tip #2: Get as early a start as possible. 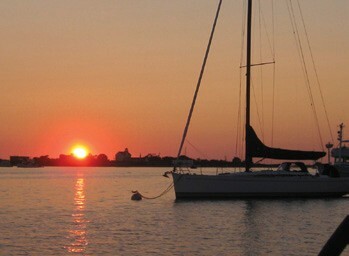 Right at dawn, the wind is often very light and presents the best time to motor out of a harbor. An early departure will also ensure your next day arrival at a new harbor during daylight and allow you to make better distances. You should never plan to arrive at an unfamiliar port late in the day; an unexpected slowdown could put you in strange waters in the dark! Rule #1: First one up puts the coffee on and the VHF weather channel on. Team up for getting underway most efficiently. One can be pouring coffee and turning on appropriate running lights and electronics below while the other is shortening scope, starting the engine, and dealing with the dinghy on deck. With only two, efficiency becomes more important. Underway Tip #3: Suit up appropriately. Early mornings are often much colder away from land; better to have to strip down later than try to put foul weather pants on while you’re driving. With only two aboard, you’ll both be busy at this point so try to be prepared. By the way, foul weather gear is the best for blocking early morning mosquitoes and gnats! Once the anchor is up and you are both ready, share the scenery over your coffee. Arrivals and departures are often where you will see the most interesting aspects of a port. Have your camera ready! A waterproof covered cockpit box with all the anticipated needs will save many trips up and down the companionway. Underway Tip #4: Set a watch schedule. Once you are clear of the harbor, and navigation is easier, divide the remaining hours until sunset by two and one of you go off watch. Go below, get comfortable and try to sleep. This will be difficult at first, but even if you just rest it will be easier to be alert when night comes. Rule # 2: When alone on deck, keep your safety harness clipped in; no exceptions! In order to sleep below, you must have the confidence that your partner on deck is safely clipped in. You must both keep this rule religiously! When the first watch is over, have your midday meal while you discuss any navigational or operational made during the first watch. Run this watch until sunset, which will give you a period of some light before nighttime. This should have given each of the crew four to six hours of rest, depending on conditions and interruptions. If you do need to interrupt the off watch person without leaving the deck, there are two ways. One is a simple police or safety whistle. They’re loud and effective, and it’s a good idea to wear one around your neck just for general safety anyway. The second way, we’ve found is the best, and maybe only way, if the engine is running. Run the engine speed up and down, up and down. For some reason, that changing noise wakes even the soundest sleeper. Rule # 3: Strive to keep interruptions of the off watch to a minimum! Only call for the off watch when navigational challenges arise. If you call your mate to see a whale, it almost guaranteed it will be gone by the time your partner gets on deck. When sunset comes and you are both awake, set the boat and yourselves into night mode. Have the right suit on, usually foul weather gear, for the coldest and perhaps wettest conditions possible. Being too warm can make you sleepy, but being too cold can have serious health considerations. Fill the cockpit box with anything you might need at night including snacks, thermos, flashlights, hats and gloves. Underway Tip #5: Have a spotlight on deck. A very powerful spotlight (preferably 12-volt powered) plugged in, tested and ready to go, can be your most important safety item when you find the need to show yourself to other vessels. Make sure your running lights are showing and the proper configuration for sailing or powering. If you use a masthead tri-color, it is only for sailing and never to be used in conjunction with your deck level nav lights. You may have noticed I haven’t mentioned anyone going off watch now that night has come. The system we found that works best with two aboard is to both stay up all night. This may seem strange until you consider that most people find it hardest to stay awake at night and that having company is effective in helping to keep one awake. The way we work it is for one person to drive and keep watch while the second sits in the cockpit keeping the watch awake. When the driver is really, really, tired, the other person takes the wheel and lets the tired one rest, even napping. This can go back and forth, but somehow works out. This system works really well when you are doing a multiple day passage, as in a Bermuda Race, but works as good as anything in a 24-hour run. When daylight comes, you can continue with this “both up” method until you get in or each take an hour nap until you are close to your destination. 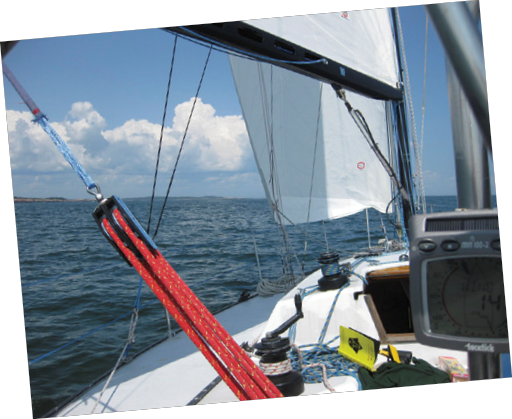 Once safely on the hook, you can start to enjoy Maine at a more leisurely pace! One thing to consider is that sailing and schedules seldom go hand in hand, so the best of plans should allow for contingencies with a well thought out Plan B. Consider what alternate ports you would likely go to in the event of fog or bad weather. If you had to wait out some foul weather, would you be happier in some remote harbor or a big bustling seaport town? If you have a sudden illness or injury, where are facilities to head for? If the boat has a problem, where are the boatyards that can serve your needs? Do you have TowBoatUS or SeaTow, and do they cover the area you’re heading for? Consider all these issues in your planning stage so that if they do occur things will go a lot easier. Underway Tip #6: Listen to your VHF radio. One of the best training aids for how to deal with emergencies is your VHF radio. When you’re sitting around the boat on a rainy day or stormy night, listen to channel 16 or scan channel 16 and the USCG working channels. Listen to the questions the Coast Guard asks those seeking help, learn the language these professionals use, and learn the names of the Sectors and Units in your area. You’ll find more information at atlanticarea.uscg.mil/Our-Organization/District-1/. True, in some circumstances your cell phone might work, but most likely you will be using the radio with initial calls handled by the USCG. Seconds count in emergencies, and speaking the same language as these fine men and women will be beneficial to all. Underway Tip #7: Keep a log. A ship’s log grows in value as each year passes. 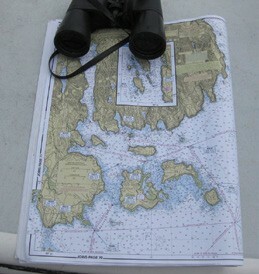 Nav notes for seldom-visited ports, reminders of people and boats met in various places; even notes of wildlife seen along the way. And someday, a memory book to be cherished. Ernie Messer has been sailing since the seventies. 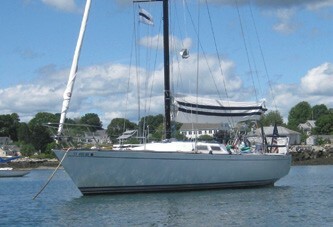 He is a member of the Cruising Club of America and Off Soundings Club. He and his wife Jan Jacobsen have sailed New England for many years and have also raced to Bermuda frequently, including three times double-handed! They sailed for 15 years on their Tartan 41 and now sail on a restored Peterson One-Ton Valour out of Westbrook, CT. Next summer will be spent doing the Newport Bermuda Race and return on Cecilie Viking, then a Maine cruise on Valour.